You love to read news and articles that exist on the internet? This of course makes you want to subscribe to the the latest news from different websites that provide RSS feeds, so that there is the ease with which keeps you up to date with news items exist. Moreover, lately very much things going on and of course this will make you continue being thirsty with the news of what is happening this very second in the world. Support your hobby, to be able to know the news available on the internet, using RSS feeds with the help of Google Reader of course is a very wise man. If you’ve never used it certainly already eloquently right what are the advantages of Google Reader. At present we are not discussing any features from the Google Reader itself, but this time we were introduced by a sophisticated desktop application to subscribe to the news. Want to know more? The Name is Gruml, currently this application just for Mac computer users, Google Reader applications this advantage is it does not stick directly on the browser, whereas he is a separate application that is attached to the dock and menu bar. What features it has? To be able to give You satisfaction, this desktop application makes it easy to archive the articles from the internet, then select and sort it using a feature ‘ starring ‘, ‘ liking ‘ and in addition you can also share information using notes and tags of the post and share them to your friends. If you are a Twitter user, there is a special feature for you that you can tweet the news because current Gruml is already integrated with Twitter, so you can divide the post via twitter that are converted using the short URL directly from the application. 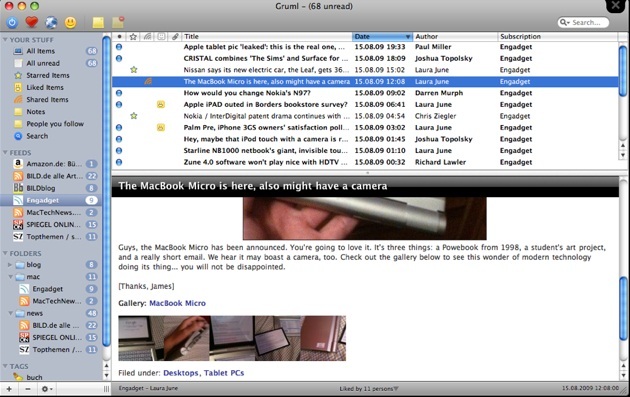 Related to "Gruml: Google Reader Desktop Application For Mac Users"